At 10 o’clock on a wet Saturday night in October 1930, residents of nearby Shipbourne witnessed the extraordinary sight of the world’s largest airship – the R101 – passing overhead just below the clouds. A few minutes later the bright lights of the cabin and the dim outline of the ship could be seen by people in Paddock Wood as the airship headed towards the coast at a speed of 50 knots (60 mph). The R101 was on the first leg of an experimental proving flight heading for Egypt and then on to India. 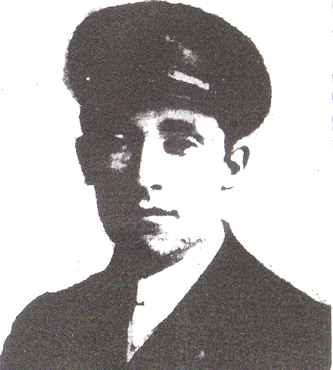 Fifty four men were on board, including among the passengers the Secretary of State for air, and among the crew a Tonbridge man, First-Class Air-Mechanic William Henry King, known as Bill. Born in a house in St Stephens Street, King had made a career in airships and was 32 at the time and unmarried. His parents were living at 8 Dernier Road and were well known in the town. Five years earlier, King had been one of a skeleton crew on board another airship, the R33, when it was torn free from its moorings in Norfolk by strong winds and blown out to sea. The crew managed to bring the damaged ship under control near the Dutch coast and nursed it back to its base. For this feat King, with his fellow crew members, was presented with an inscribed watch which became one of his most treasured possessions. 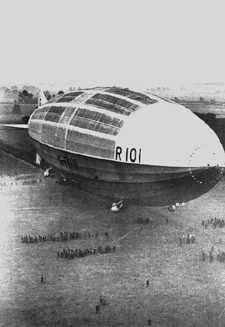 The airship on which Air-Mechanic King was serving in 1930 – the R101 – was as long as a battleship and as high as Nelson’s column. Inside its rigid hull were huge bags of inflammable hydrogen gas, 500,000 cubic feet (15,000 cubic metres) in all, providing the lift to keep the ship aloft. Five diesel engines on the underside turned propellers to drive the craft along. The lavishly-appointed living quarters were inside the hull, but with windows below so that passengers could see the landscape passing beneath. 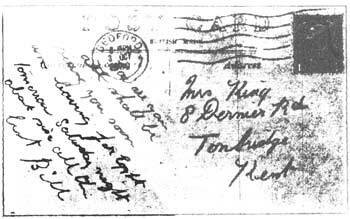 At 1.52 a.m. on Sunday 4th October a receiving station at Croydon picked up a radio message from the R101 confirming its position over northern France. After that no more was heard. Soon after 2 a.m. the airship had come down on a hillside near Beauvais and almost immediately been totally destroyed by fire. Forty-six of the passengers and crew were burned to death, and of the eight survivors two would die soon after. It was, in the words of the Illustrated London News, 'the greatest disaster in the history of aviation'. 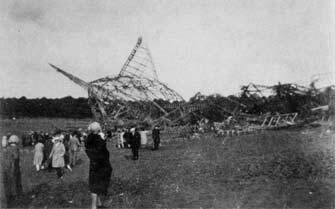 News that something had gone terribly wrong with the R101 was brought to Tonbridge early on the Sunday morning by railwaymen coming off shift, and spread by word of mouth. ‘Tonbridge and district’, according to the local paper, ‘was horrified ... to hear of the disaster to the great airship’, with ‘incredulity, amazement and depression ... written on every face’. Eventually confirmation came through on the wireless. Special editions of the Sunday newspapers were produced and large crowds assembled near the newsagents in the High Street to await their arrival. Supplies were sold out in minutes and more had to be ordered. Special prayers were offered at Sunday services and the flag on the Castle lowered to half-mast. Soon after noon on the following Wednesday the funeral train bearing the bodies of those who had died passed through Tonbridge station, where ‘reverence and homage was paid’. From Victoria Station the coffin of Bill King, with 47 others, was taken to Westminster Hall to lie in state while tens of thousands of mourners filed past. On the Friday one of King’s brothers and two of his sisters were present at a memorial service in St Paul’s Cathedral at which King George V was represented by the Prince of Wales, and on the Saturday the whole family attended the funeral at Cardington in Bedfordshire where the airship was based. The 48 victims of the R101 disaster are buried in the cemetery of St Mary’s church, Cardington, where a prominent memorial commemorates them. Pensions and gratuities were awarded to the widows and children of those killed in the accident, though in King's case, since he was unmarried, the family only received a single payment of £125 (equivalent to about £5000 today). The report of the Court of Enquiry issued in April 1931 recorded the likely cause of the accident as loss of gas at the front end of the airship probably resulting from a tear in its outer skin caused by buffeting by wind. It was clear, too, that pressure for the flight to coincide with the ‘Imperial Conference’ being held in London meant the ship had set off before an adequate programme of testing had been completed. When the even larger Hindenburg was destroyed by fire in New Jersey seven years later it was clear there was no future for hydrogen-filled airships. The captain of the R101, Flight-Lieutenant H. C. Irwin, who was among the dead, had many years' airship experience and was said to be someone who would never take unnecessary risks. He was on record as saying that 'there is a feeling still among the public that airships are not safe. That is quite wrong. As a matter of fact they are safer than sea ships ...'. > Further information about the R101 and its crew can be found on the Bedford Borough Council and Shortstown Heritage websites. Much of the information on this page comes from a report in the Tonbridge Free Press of 10th October 1930, available on microfilm in Tonbridge Reference Library.